Hello, I’m Doug, how can I be of service? I know most of you are here to learn about my services and to see if I am a good fit for your real estate needs. The rest of you are just checking me out because you somehow found me on the internet. Either way, I’m glad you’re here. Representing Northern Colorado homeowners and future homeowners with the goal of getting their best result. My commitment to honest dealings combined with aggressive representation is unique in the real estate profession. I love the real estate business and Northern Colorado. Let me sort through and guide you through the oftentimes challenging real estate landscape. I have the experience and local know-how to assist you in making the wisest real estate decisions. For example: when to buy, when to sell, where to buy, what neighborhoods best match you, insights into schools and districts, best route to travel during high traffic, am I getting a good deal? The thing is, I am not a sugar-coating type of guy, I am known for being a straight-shooter and telling it like it is but with a high level of emotional intelligence. Licensed since 2000 (Broker since 2005). Seasoned experience in hot and cold markets, for buyers and sellers, challenging transactions, difficult circumstances and everything in between. Marketing & Negotiation are my strengths. In my view, marketing gets the attention but negotiation gets you what you want/need. Technology is one of our greatest assets BUT is not a substitute for good old fashioned hard work and beating the pavement. The latter is one of my staples for getting client results. Historically high success rate for list to sell price and moving transaction forward towards the closing (for buyers and sellers). Proudly, the majority of my business is from word of mouth, past client dealings and referrals. I have never been part of a lawsuit, mediation or any other legal matter related to my real estate dealings (personal as well). One of my primary focuses is to be aggressive on your behalf but not stupid, negligent or downright unethical. One of my favorite quotes: “You will get all you want in life, if you help enough other people get what they want”. Zig Ziglar. This is truly how I want to serve others, by putting their needs above my own. If I do this often enough, I’ll be fine! Since the day I was born, I have been exposed to all things real estate. My Dad was one of the first brokers where I grew up. Yes, these were the days when the MLS was delivered to the brokers office in a printed format. During high school I started working for a custom builder (Eason Construction- Newport Beach, CA) and loved it. At the time, I was a laborer but being around something that was once nothing and then turned into something tangible and oftentimes spectacular was a great experience for me. During my college years, I worked for a tract homebuilder (Mission Viejo Company- Mission Viejo, CA) a couple days a week when I had a lightly course load. I was moving up in the ranks from laborer to quality control. I basically tagged and wrote lists all day about what was wrong and who needed to correct it. After college (Vanguard University), I went back to work for another custom builder (Akins Companies, Newport Beach, CA). About the time I joined, they started doing small semi-custom homes and later moved on to tract homes while still maintaining a custom division. A few years later, they were purchased by Brookfield Companies (a national builder). I elected to start my own business as a General & Painting Contractor. I did that for a few years but knew it was an un-sustainable pace particularly since my wife and I wanted to start having children in the near term. My wife and I decided to start a real estate team with the firm she was already with (First Team Real Estate Orange County, CA). We were doing very well and then she got pregnant. Our value was to try and have her stay at home as much as possible. We quickly realized that a one income family in Orange County was going to be very difficult and would not offer the quality of life that we sought. Moving to Colorado was not a random thing. Even before my wife and I got married I told her that if this thing works out, I really don’t want to raise kids in California. The timing was right and we moved in 2005. The cold and snow takes a little getting used to but with that comes and appreciation for four seasons and a better quality of life. So, here we are, the Lindstrom family. Good to meet you! Let me introduce you to my crew. 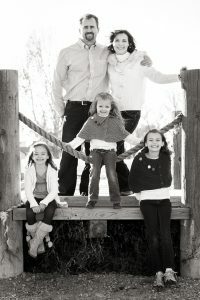 My wife Jenn, my oldest Abigail, my middle MacKenzie and my baby Cambria.